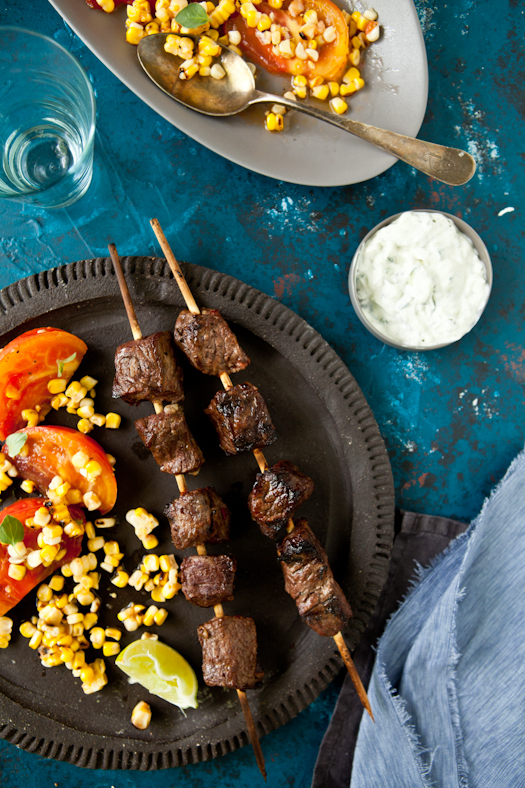 Lamb Kebabs and Lamb Burgers With Tomato & Grilled Corn Salad With Sriracha Vinaigrette. I moved to Birmingham at the tail end of the Pepper Place Farmers Market which filled me simultaneouly with great sadness to have missed much of its summer bounty and with great excitment about the upcoming Spring when it would be back in full swing. Within a five minute drive, I am there around 7am every Saturday I am in town. And then I hop to a couple more markets around town just to make sure I am not missing anything. It makes me feel connected to home and summers spent in the Alpes going to the market with my mom. I'd go stir crazy running from stand to stand. Berries, tomatoes, cantaloupe, honey, fresh cheeses, cherries, peaches, herbs galore. So yes, that's what I do on Saturdays. I take a virtual trip back home, even if just briefly with such early morning escapades. My panier (basket) in tow and lovely memories of squeezing my mom's hand with excitement upon each stand we would stop and visit. I grow even more nostalgic when I see my family's pictures on Facebook or other of all the fun shared during "les grandes vacances" (summer holidays) when they all gather at the family home. This ability to transport myself back to that place in my life grounds me into the present as much as it makes my heart sink I am not there with them. I love closing my eyes and reliving sounds and smells of my childhood. The cicadas by my bedroom window. Fresh cut cantaloupe with a dash of Port for the adults. Kebabs and veggies sizzling on the grill. Wildflowers and cool clear streams on our hikes in the morning. There isn't a closer place closer to summer vacation paradise. Many training wheel were cast aside there. Many nights spent sleeping "a la belle etoile" trying to catch a meteor shower. I think that's my happy place. 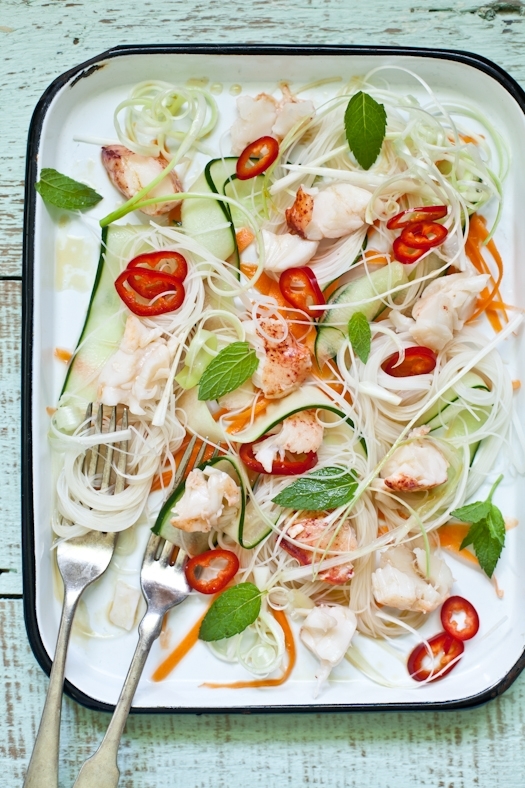 Lovely simple summer foods. 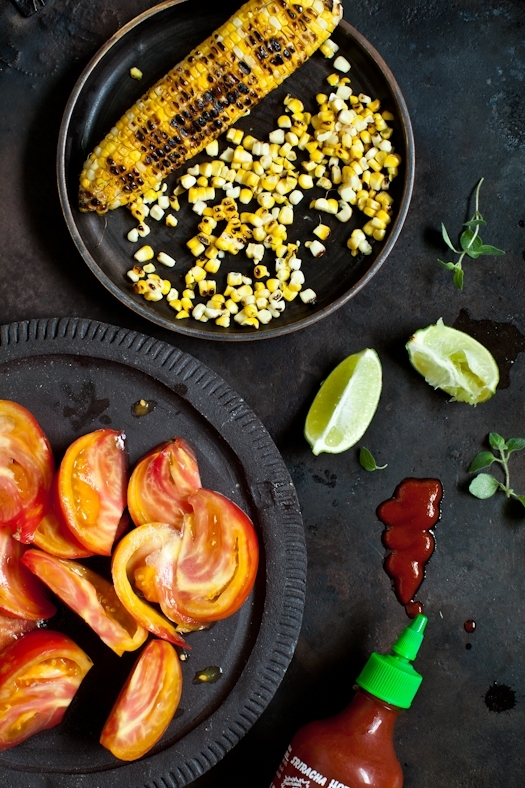 Tomatoes and grilled corn. Marinated meat thrown on the grill. Fish cooked just so over hot coals. And the simplest of salads, burgers and drinks on a hot summer day. Nothing like local ripe produce and tasty meats to make me feel in the throw of Summer, just as if I were back home. When the market stalls overflow with fresh corn, heirloom tomatoes and cucumbers, you can be sure that they end up in my basket in no time. I was thrilled to be able to get local lamb from one of our freelance food stylists, Ana, who operates Dayspring Dairy farm. The same lady who always comes to work with a few dozens eggs from her chickens and gifted me with sheep milk ricotta a few weeks ago. Dayspring Dairy's lamb is young, mild and very tender. A pleasure to create a meal around and share with friends for an impromptu dinner. 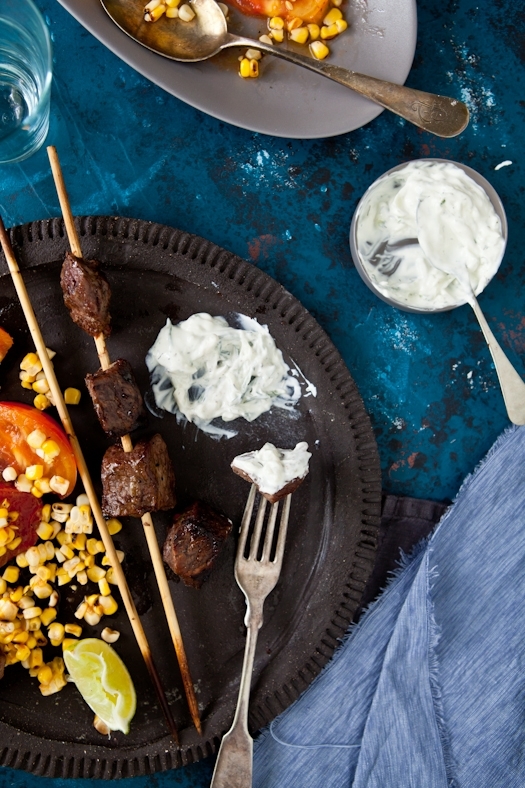 Big chunks of lamb shoulder were marinated in a flavorful concoction of cumin and chili, grilled just until medium rare and served with tzatziki and my new favorite tomato and grilled corn salad. Oh, yes... That salad has been made several times a week for the past month. I can't stop at a serving. Or two. 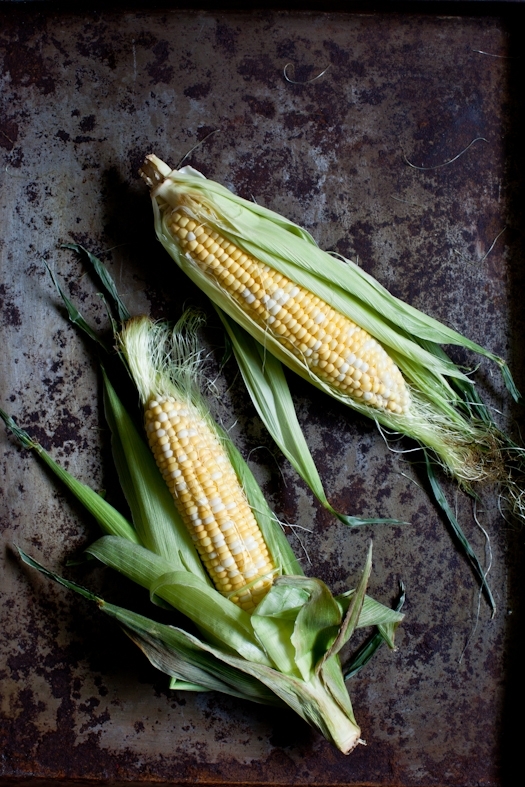 Fresh corn, grilled with a dab of olive oil, big chunks of big juicy tomato and a Sriracha vinaigrette. Yes again. So good...I get *this* close to not sharing when I make it. I rarely eat a burger just to eat a burger but, if you ask my closest friends, I do go all out when I decide to have them over for burger night. Loads and loads of different buns, sauces, garnishes, pickles, etc... However, when it comes down to my favorite way to eat a burger, I am pretty straightforward. 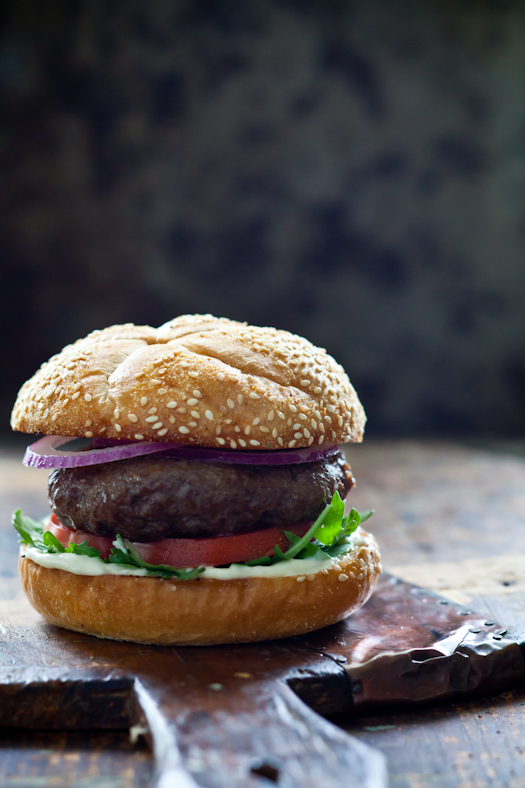 Toasted bun, garlic aioli, a thick slice of ripe tomato, arugula and red onion. That's it. Makes me a whole lot of happy. So here you go, I wanted to share a few favorites of the summer so far. Hope you are enjoying time with friends and loved ones! The last few weeks have been somewhat of a blur. A good blur. I wrapped up the shoot of the new Lodge Cast Iron book that should hit the shelves this Fall. Got to shoot the most amazing food for a Cooking Light book for 2014 and just started shooting a really hip and fun cookbook for Southern Living. Long days, gorgeous foods, awesome team and an empty brain at the end of the day are the perfect recipe to prevent me from being productive on the blog, ahah! A little hibernation took place also. You see, after 8 months living in different cities, my husband finally brought the last load of his boxes and officially moved in a couple of weeks ago. And well, after months apart, albeit with a few visits here and there when our schedules permitted, I chose to spend time away from this page and fill it with "us" instead. We had plenty of things to do around Birmingham together that we had put on hold while we were apart. 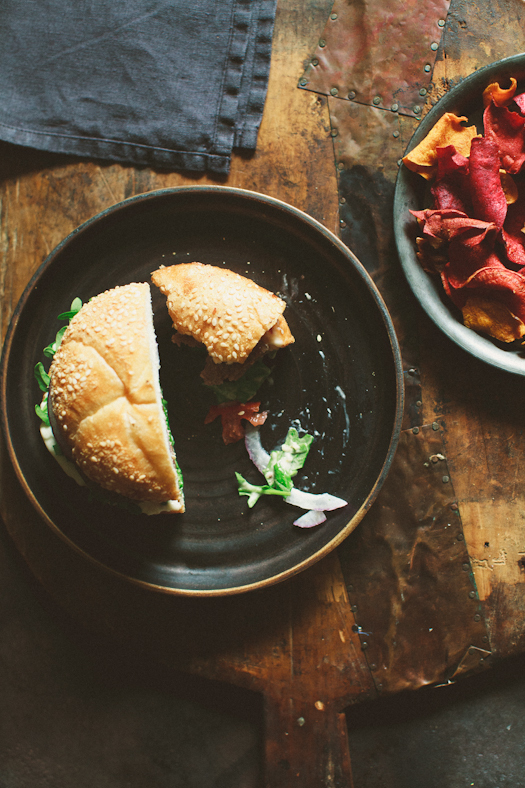 Our evenings were spent cooking dinner, having a glass of wine on the back deck and talking. Weekends were filled with short outings or longer road trips to discover our new state. And then there was our 15th anniversary. Neither of us could believe it. Not that we were surprised we had been together this long. No, just the simple notion that it really does not feel like 15 years. We remember each year as if it had just happened. 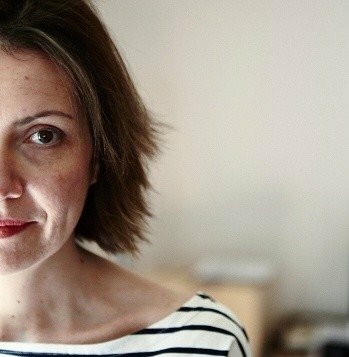 And the realization that, with these 15 years, our couple is all sorts of thing. Strange, hard to comprehend at times and for others, awesome, rocking. Serious, funny, unbalanced, observant. Quiet, musical, sonorous. Certainly not dull, conventional or lacking stories. A solid, rocking fifteen years of fun, struggles, and lots and love of love and communication to season it all. We had a big party with our new friends, neighbors and old ones who made the drive to come celebrate with us. Kids running around, dogs chasing each other and adults taking part in a lovely evening of sangria and grilling on the back deck. We are very much looking forward to the next 15 years together with the people we love and the friends we make. In between going out to new restaurants, pubs, events and hanging with friends for dinner, we both felt like a little clean-er or/and simpler eating was in order. Peaches made their appearance on many salads and were devoured au naturel or grilled for dessert. 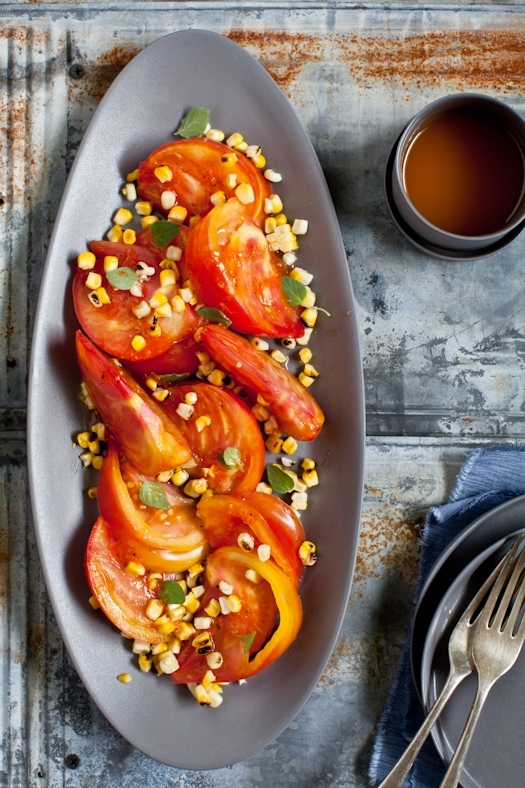 Tomatoes were sliced, cut, chopped and dressed in many various ways to steal the show of our dinners. And then there was these whole two giant lobsters left from a photo shoot that I had picked over and frozen with the hope of creating the perfect recipes for the sweet tender flesh of the lobster. 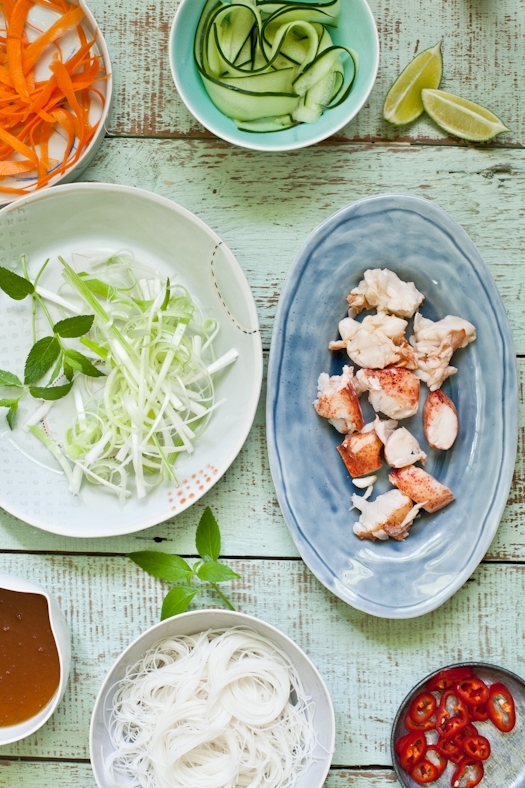 I settled on a super fresh salad with an Asian flair: big chunks of perfectly steamed lobster with ribbons of cucumbers and carrots and long threads of rice noodles, lots of mint, lime and chili for a little kick. 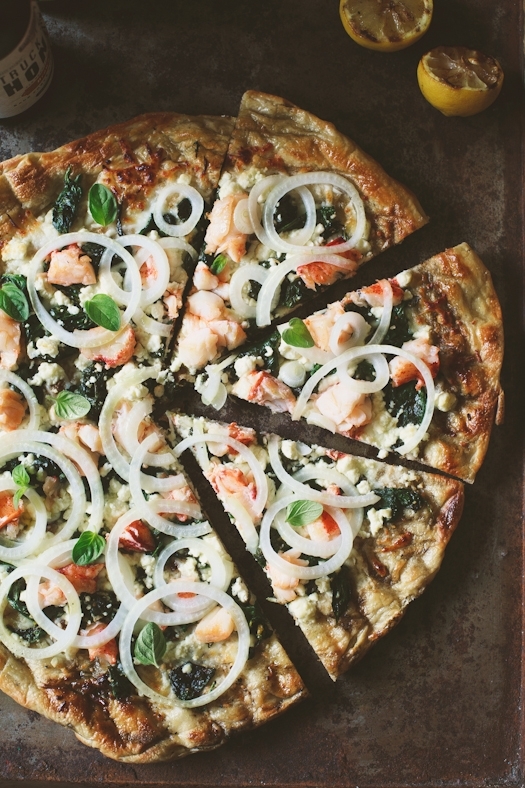 The second recipe I wanted to try for the lobster was a grilled lobster pizza with plenty of spinach, feta, Vidalia onion. Since the lobster was already steamed, grilling the pizza dough and then layering the ingredients at the last minute on the crust kept the lobster meat tender and juicy. Paired with a little herb salad and a cold beverage and we had all the making to a lovely meal a deux. A little workshop update before getting onto today's dessert: there are a few spots available for the workshop I am teaching with food stylist Tami Hardeman and prop stylist Mindi Shapiro July 26-28th in Birmingham (details here). Two full days of complete hands on instructions about how to food style, prop and photograph challenging items such as cocktails, drinks, casseroles, dips and spreads. We will give you all our techniques and tips while working in a naturally lit professional photo studio in downtown Birmingham. Every time I see berries I think about my parents, my family, my childhood, Provence and the Hautes Alpes. I can't help it. We would spend the greater part of the summer in the Alps where my parents have a chalet and pick berries by the side of the road. Wild strawberries, blueberries, blackberries, raspberries. It was one of the activities we loved to get involved in, as much as trout fishing on Sundays or snail "hunting" after the rain with my grandfather. 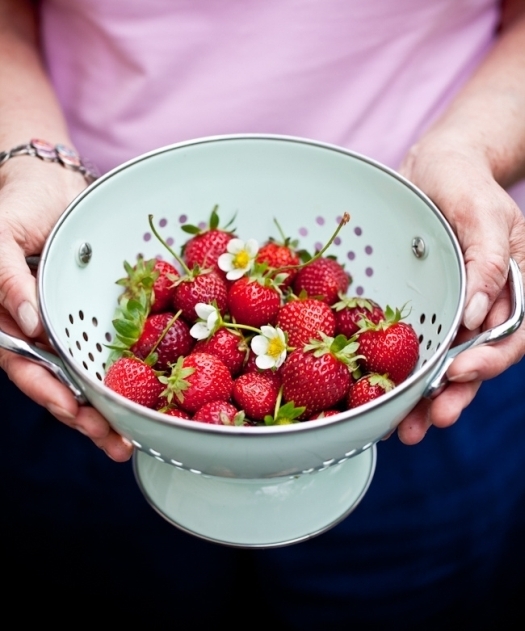 Buckets of strawberries, blueberries and blackberries would then be turned into jams and jellies. Jars upon jars would fill our pantry, my grandparents pantry and would be gifted to neighbors throughout the year. I always thought of my mother and grandmother as jam fairies. I do my best to follow suit and preserve or turn into jam the bounty of each season. I make smaller batches. I experiment a little bit more with spices and combinations. I try to keep their teachings and legacy alive. I also turn much of what I gather and pick into baked goods, infusions and ice creams. When I get more than I can handle I make cobblers and crisps. Or clafoutis, sauces and compotes. Nothing gets lost. 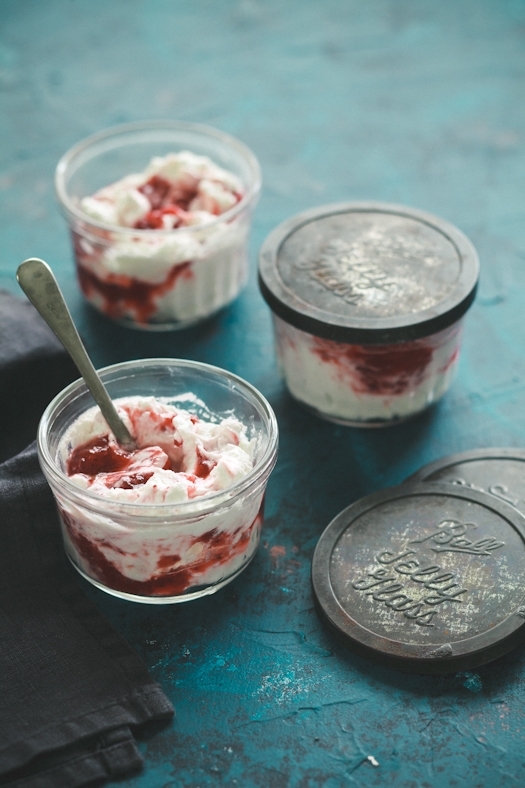 I love just cooking a big pot of berries into a soft compote to be spooned over yogurt, ice cream or mousse. 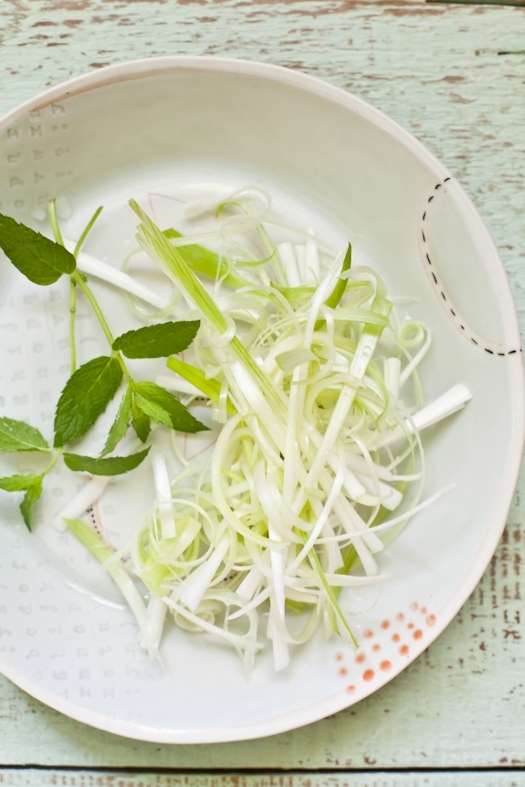 A super simple way to end a summer meal. Soft textures and layers of flavors. A few weeks ago, one of our freelance food stylists gifted me with a dozen eggs from her chickens and sheep's milk ricotta from her dairy farm, Dayspring Dairy. 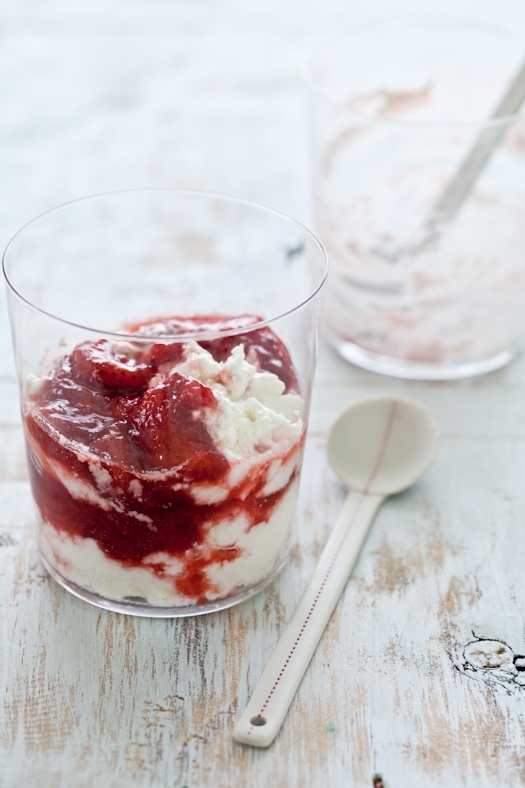 I knew right from the start that I wanted to turn the ricotta into a mousse. And layer it with berrries or berry compote. There is something special about homemade dairy. More so when you know the story and people behind it and what it took to have such treasure in my hands. 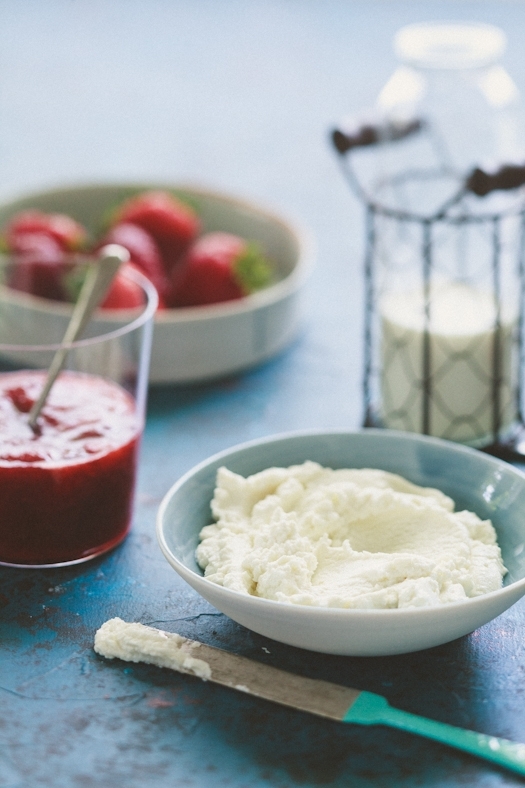 To make the most of that ricotta, I simply folded it with honey and whipped cream and layered it with softly cooked strawberries. A little soft, a little chunky, a little sweet and a whole lot perfect.